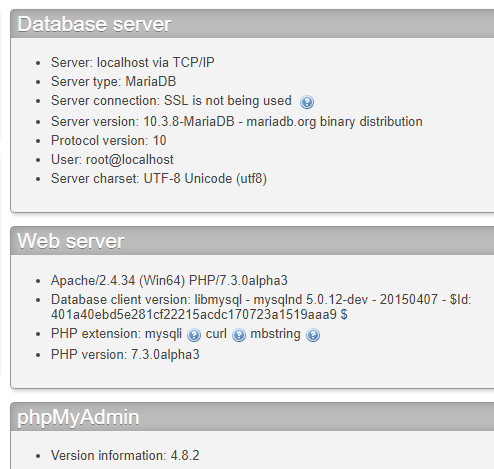 MariaDB is a database management system (DBMS), which is based on MySQL and is largely compatible with it. MariaDB and MySQL are fully compatible in the syntax of SQL queries. That is, if your program uses MySQL databases (for example, a website in PHP), then when you upgrade to MariaDB, you do not need to change anything in the program. MariaDB is also binary compatible with MySQL connectors. Therefore, you do not need to change them after the upgrading. MariaDB 10.2 is compatible with previous versions of MariaDB data files, as well as with MySQL 5.6 and MySQL 5.7, but is not compatible with MySQL 8.0. 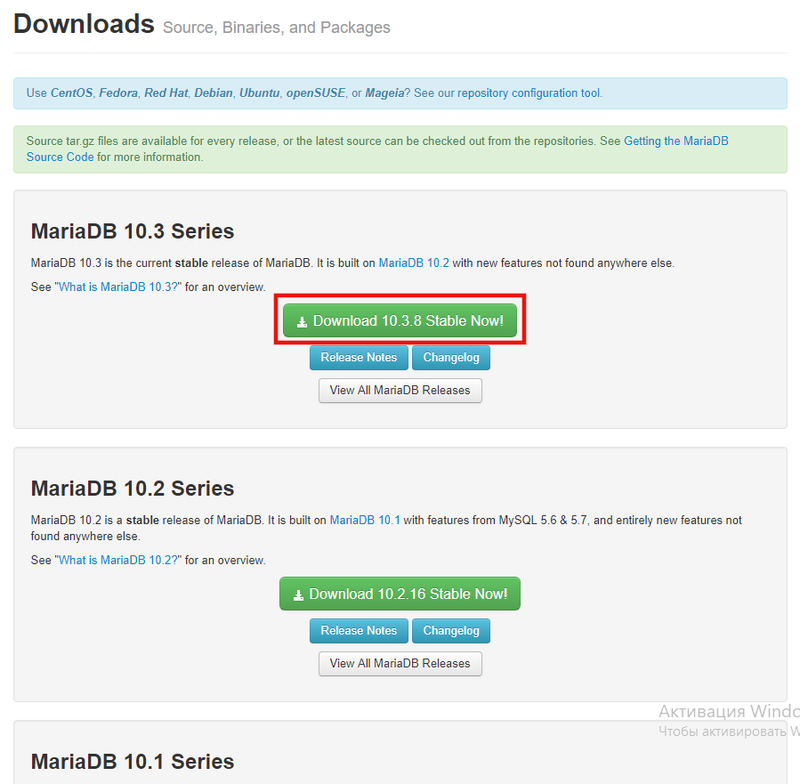 MariaDB 10.1 is compatible with previous versions of MariaDB data files, as well as with MySQL 5.6. MariaDB runs on Windows and Linux. This program is completely open source. It is distributed in the form of source codes, as well as compiled executable files for Windows and all popular Linux distributions. MariaDB supports more Storage Engines. ColumnStore, a column oriented storage engine optimized for Data warehousing. Aria, MyISAM replacement with better caching..
MariaDB has many different improvements and optimizations in the speed of data processing. MariaDB is supplemented with new extensions and functions. You will see several series - several major versions of the program. If you do not need any specific compatibility with MySQL, then just select the latest version and click the ‘Download’ button. Since this program runs on different operating systems, in the next window you will see a large selection of files for download. Windows x86_64 file are 64-bit versions, and Windows x86 are 32-bit versions. 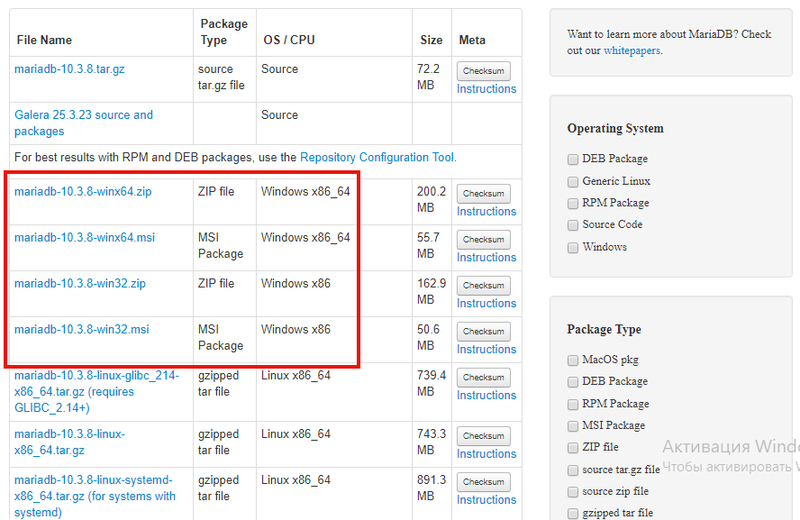 .zip are portable versions that you need to install by yourself, but which give you complete freedom in fine tuning..msi is an installer for Windows. In this manual, I will use the .zip version. For Windows, the MariaDB is distributed as an installer and ZIP archive. I prefer installation from a ZIP archive, since it gives full control over the process. Installation in all the examples I perform in the C:\Server\bin\ folder, because MariaDB is part of the web server installed according to this guide. If your conditions are different, then consider this and make appropriate amendments. Unzip the downloaded archive from MariaDB, rename the folder to mariadb and move it to C:\Server\bin\. Move the C:\Server\bin\mariadb\data\ folder to the C:\Server\data\DB\ folder. You can perform the upgrading in different ways. I will show the most universal method, which guarantees full compatibility and the absence of further problems. You need to start by creating a backup of the databases. We will do this in the Windows command line using the mysqldump utility (supplied with MySQL and located in the bin folder). Now in the C:\Server\bin\mysql-8.0\bin\ folder the all-databases.sql file will appear - be sure to copy it to a safe place! In addition, copy the C:\Server\data\DB\data\ folder to the safe place - this is an additional backup of the MySQL database files - in case something goes wrong with MariaDB and you want to roll back to MySQL. Now delete the C:\Server\bin\mysql-8.0\ (binary files) and C:\Server\data\DB\data\ folders. Wait until the import is complete - if the file is large, the process can take for a while. Delete the C:\Server\bin\mysql-8.0\ (binary files) and C:\Server\data\DB\data\ folders.